We offer you a range of classes and activities for pursuing self-discovery and spiritual inquiry. 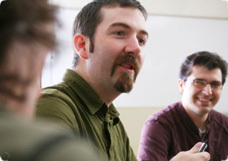 Our center attracts a steady stream of students from the Boston area and beyond. If you are new to the center, we invite you to participate in any classes that suit your interests and schedule. We hold new introductory meditation classes, follow-up classes that focus on mantra meditation and Advaita, and a variety of Sanskrit classes several times a year. We also offer various drop-in activities that do not require registration, including our open meditation evenings (see Meditation below). We believe you will find our offerings to be deeply rewarding. We welcome you to join us. Meditation: Learn useful meditative practices during our introductory course (that may culminate in your initiation into mantra meditation) or at our weekly open meditation evenings (Wednesdays). Sanskrit: We offer a variety of Sanskrit classes, both for beginners and for those with some Sanskrit knowledge. Classes can include chanting, learning the alphabet, and studying scriptures and grammar. Drop-in Opportunities: These activities allow you to experience what we offer at the center without formal registration. They include open meditation evenings, reading groups and yoga. Ongoing Study: After taking the introductory courses, you can further your knowledge of Advaita philosophy and meditative practices in weekly practice and discussion groups. Our Teachers: They are skilled, empathetic, experienced—and committed to sharing their practical understanding of meditation and Advaita with you. Complete Schedule: Want to see what’s available? Check a listing of our current activities. Register Now: Ready to register? Click here or visit any of the Classes and Activities pages. To learn more about our classes and activities, please contact us at 781-647-0020 or info@advaitameditation.org.